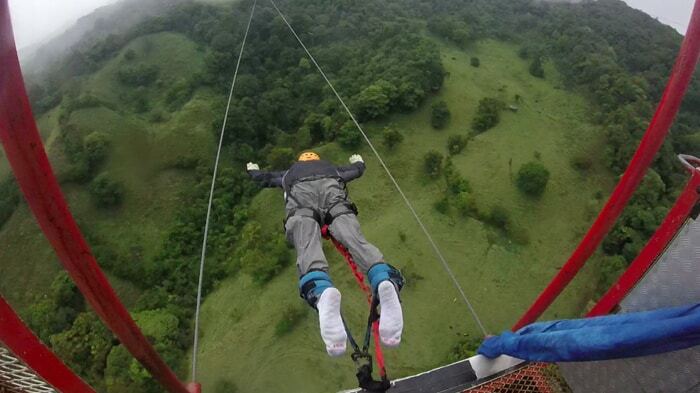 MONTEVERDE, Puntarenas — Even as spectators at a distance Saturday from the safety of solid ground, we gasped in shock as we saw the other bungee jumpers leap from the platform suspended in the sky. It felt like watching people die. The plunging people seemed to fall forever, the incredibly long cord taking its sweet time to catch, at which point the jumpers appeared to hit an invisible trampoline and bounce in the opposite direction — up — no doubt to their great relief. Extremo Park’s bungee jump, said to be the highest in Latin America and the only one left in Costa Rica, is 143 meters (469 feet) high, from the little aerial tram to the bottom of this huge, beautiful valley. “We are 143 meters high from the river, and your jump is between 80 and 100 meters, depending on your weight,” said Andrés, one of two jumpmasters here today to whom all of this was so routine. The tram returned with two happy customers, young women from Europe who were all smiles and thumbs up. One of them claimed she wasn’t even scared. Yeah, right. It was go time. Nico, 19, of Germany, and Hansol, 21, of South Korea crawled onto the back bench of the bungee tram with Karl, 51, of Arkansas. Andrés and Danny welcomed us aboard but skipped the customary funny remarks most tour guides use to introduce themselves. These guys were not here to talk, they were here to run bungee. The tram lurched into motion over the valley, and the newbies started gasping already. The bungee tram (which reminded me of the classic Rio-Jaws-Bond cable-car scene in “Moonraker”) runs on cables attached to the mountains on either side of this spectacular valley. Of course this cage has a see-through steel-mesh floor, the better to prime the pump of that most primordial of human phobias, the fear of heights. Even better, the tram was leaning to the right, the side I was sitting on, like it was about to flip over. I tried not to think about it, tried to enjoy the view, but it’s hard to enjoy scenery from an altitude like this when the vessel you’re in appears to be dangerously listing. We reached the jump spot, and young Nico bravely volunteered to go first. But his bravery appeared to diminish with every step he took toward the edge of the bungee cage. Listo! Walk to the edge, my friend. Closer. Feet together. Ready to go! “Wait!” Nico had a question about where he should jump. I think he asked the guys, “In which direction?” while looking to the left as if he were supposed to jump that way. The guys did the countdown again, but for the second time Nico balked. I couldn’t blame him. I knew that forcing myself to jump off that edge might be the hardest thing I’d ever done. And suddenly — Nico was gone! We could see him through the floor, falling an unthinkable distance before the cord caught and he bounced back up. The guys lowered a rope with a carabiner on the end, and Nico grabbed it and clipped it to his harness. Danny hauled him up with a hand-cranked wheel. Nico returned to the safety of our steel cage looking not the least bit rattled. While Hansol got strapped in, Nico sat next to me and said the free fall happens so fast you don’t have time to be afraid. Hansol jumped feet first, which is not recommended, but despite her screams she made it back to the top just fine. It was the old man’s turn. The release I signed in the office said something about people over 50 needing medical clearance — like I was supposed to bring a doctor’s note! Like I have a doctor! I was absolutely terrified. I was not having fun. When I review this adventure, I thought, I’m going to tell people it’s a terrible idea. It’s impossible to have fun doing something this scary. I shuffled toward the edge, dragging my ankle gear, the fear alarms going off in every fiber of my being. The guys hooked me up and told me to walk closer to the end. I’m going to hate this, I thought. I’m going to hate it and I’m going to tell everybody else that they’ll hate it too. There were two little steel loops screwed into the bar overheard to hold onto. The guys told me to move just a little closer. Put my feet together. Listo! There was no turning back. I came here to do this. It was time to stop talking about it and do it. I dove. I flew. I plunged. I didn’t make a sound. I had my arms out and a grin on my face. I didn’t hate it! Huge surprise! This was awesome! The boinging up and down went on a long time, during which I was laughing, exclaiming and thoroughly enjoying myself. Not to suggest the terror ever went away. Once I stopped bouncing enough to realize I was hanging by my feet from a little rope in thin air, waves of fear washed over me again (and again). Danny had made me take my boots off because they rose to the ankles, and he needed those ankles for the Velcro ankle harness. So I jumped in my socks. But now, hanging upside down in thin air like a giant bat missing a branch, I was afraid that my skinny ankles would slip right out of the Velcro and I would plunge straight to my death. So I instinctively pulled my toes up (actually down) as far as I could, trying to create an L shape that I couldn’t slip out of. Rationally I knew I was being stupid and I should just relax and enjoy the view. But I was hanging by a little rope hundreds of feet in the air! I couldn’t bring myself to unflex my feet. Like that would be the one way I screwed up — relaxing. I remembered I had work to do. I found the rope the guys dropped and grabbed it, then started pulling it up to get to the crucial carabiner on the end. The guys up top cranked on the rope from their end, and at one point it slid through my gloves really fast, which is why you wear gloves. I grabbed the carabiner and managed to hook it to my waist harness, all of course upside down at the end of a rope like I’m Tom Cruise and this is “Mission Impossible.” Good thing I brought zippered pants for my wallet, iPhone and room key. 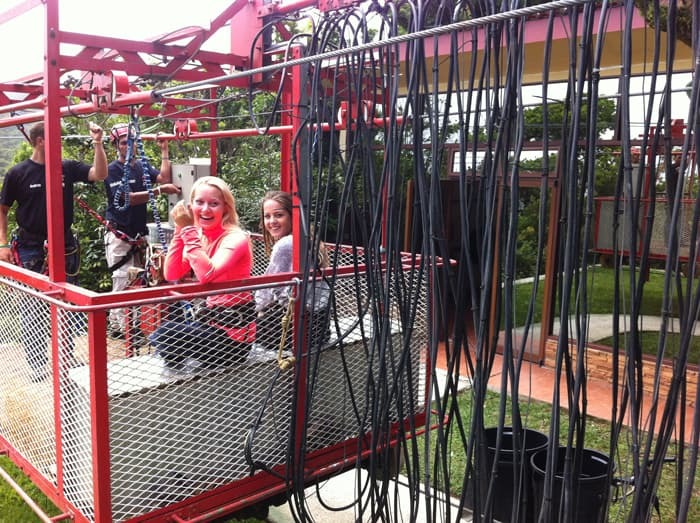 Danny started cranking, and I felt myself being hauled up like some exotic animal rescued in midair. After a minute or so the rope turned me right-side up again, and I was able to sit, take in the view and relax my feet. I made it back to the platform and joked with the guys that I thought this was supposed to be scary. Danny asked for my left hand — “No, your left hand” — and pulled me onto the platform. I kept clinging to his hand. Danny said he needed his hand back. When we returned to the safety of solid ground (in pouring rain), a half-dozen jumpers gathered under a roof to watch the videos filmed by our helmets and by the guys above. The last one shown was the top-down video of the old man — in which I executed a swan dive so perfect that everyone exclaimed when they saw it. “This was the best jump,” Danny said. It looked like I’d done this 100 times before, though I was a bungee virgin like almost everyone else here. I asked Nico if he would do it again. “Of course,” he said. He shook his head no, then said, “Wait,” and fired up a video on his computer. The video crash-lands in a tree. Women watching the video shrieked. Danny smiled and nodded. He said a jumper got twisted up in the rope and it popped his GoPro helmet off, and both helmet and camera plunged to the ground. The camera didn’t even break — a testament to how thick the canopy is in these lush mountains, not to mention how well GoPro cameras are built. “These cameras are tough,” Danny said. I asked Danny how many people chicken out, pay their money and ride out in the cage and then are too afraid to jump? Very few, he said. Maybe 4 or 5 percent. My advice: If bungee-jumping is something you would never, ever do because it looks like the exact opposite of what any normal human being would ever want to do for any reason, then you don’t need my advice. But if you feel weirdly drawn to this most extreme of adventures, Monteverde just might be the greatest place in the world to try it first. 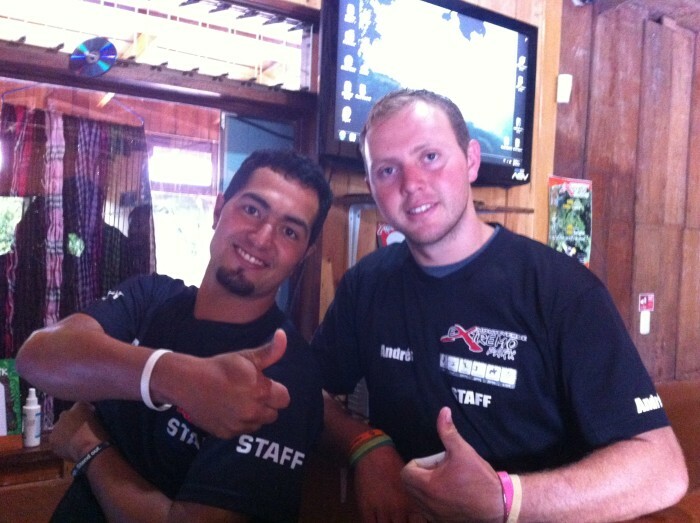 Getting there: Transportation to and from Extremo Park is included for any hotel in the Monteverde area. What to bring: Be prepared for rain and cold, but the less you bring the better — all bags are left at the front desk or in the car, and phones and cameras are discouraged on the bungee platform. If you want to bring your phone, wallet, keys or passport, wear zippered pants.